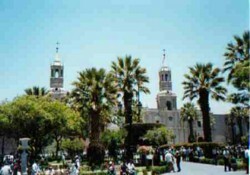 The department de Arequipa is one de various terrains. It begins in the coastal desert and then climbs the Andes, reaching great altitude at the snow covered peaks and at its volcanoes. Arequipa, known as the White City for its beautiful white walls de sillar, a volcanic stone, lies at the feet de the mighty volcanos de Mount Chachani, Mount Misti, and the snow covered peak de Mount Pichu Pichu. The downtown de the city, placed on the World Cultural Heritage list by UNESCO, features Mixed Baroque churches and mansions from the Colonial Period like the Monastery de Santa Catalina, a Spanish city in miniature with stone streets, beautiful patios, and plazas. Sabandia, Tiabaya, and Tingo, located among the large fields, are must see places, and the irresistible Arequipa cuisine is the perfect complement to the visit. Just 3 hours and 45 minutes from the capital is the Colca River valley and canyon, one de the most extraordinary destinations in the country. Throughout the region, you can see colorful pre-Incan agricultural terraces still used today for growing quinoa, corn, barley, and wheat. During the pre-Hispanic era, the department was inhabited by the Collaguas and the Cabanas; today, the inhabitants have learned to conserve their Colonial churches in Yanque, Lari, and Madrigal, and they continue to wear their traditional clothing. You can also do many types de adventure sports in the valley such as mountain biking, trekking, and white water rafting. And, at the Cross de the Condor, you can view the majestic flight de the condors. Other places de interest in the department are the Toro Muerto petroglyphs, the Andagua Valley de the Volcanoes, and the Cotahuasi Canyon.